Mary + Joseph were such a sweet, amazing couple, and we absolutely loved getting to capture their engagement session and wedding this summer! These two were married in a beautiful ceremony at St. Cecelia Catholic Church in Clearwater, followed by a reception at Carlouel Yacht Club in Clearwater Beach. It was a gorgeous day, Mary was a stunning bride, and we were so honored to be there to capture all the details of this amazing event! Our Master Photographer Cornelia was there to spend the day with Mary + Joseph, and she did such an amazing job. We’re so happy to share some of our favorites from this special wedding! 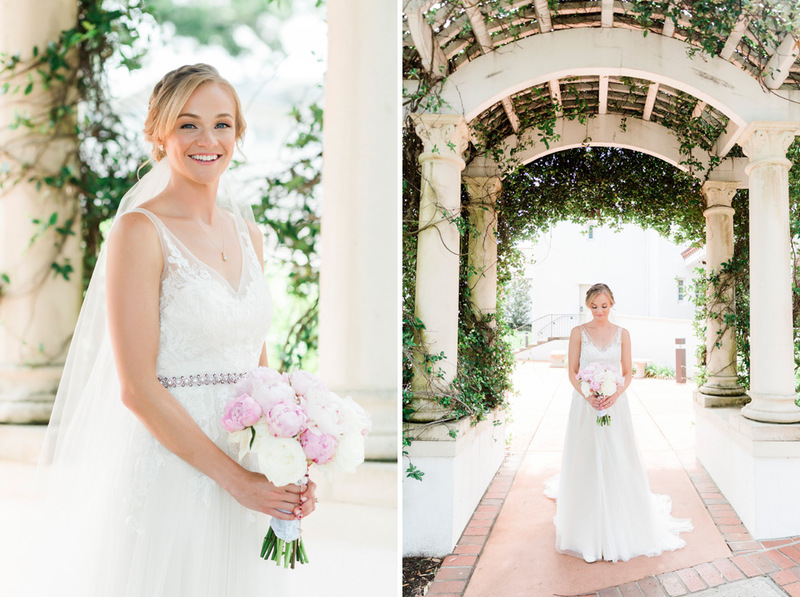 Mary was an absolutely stunning bride! 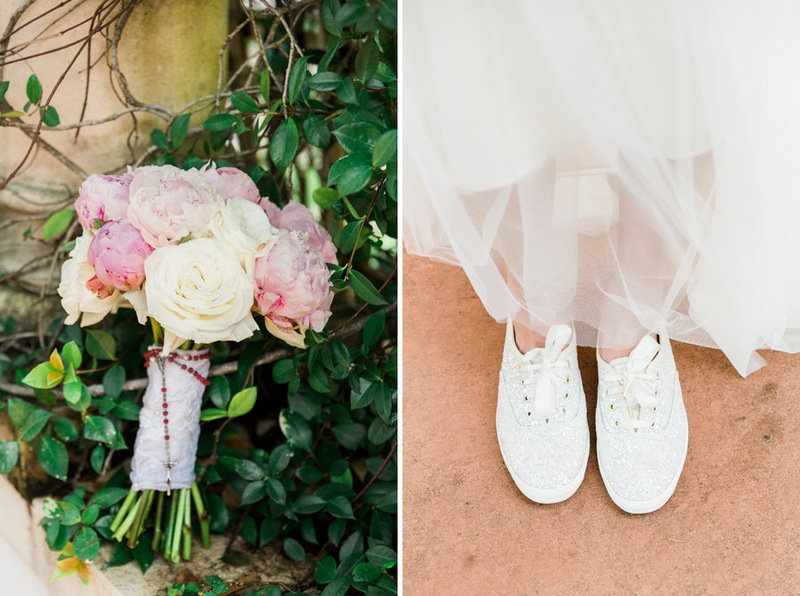 We loved her sparkly, comfy shoes – that’s our idea of perfect wedding footwear. 🙂 Mary + Joseph were married at St. Cecelia Catholic Church in Clearwater – the same church her parents had been married in years before. Isn’t that cool? It was a beautiful ceremony with Mary + Joseph surrounded by their family and friends as they exchanged vows. Immediately after the wedding ceremony, the bridal party moved to the Carlouel Yacht Club in Clearwater Beach for photos before the start of cocktail hour. We love the way the blues in the bridesmaid’s dresses and groomsmen’s suits all match perfectly together. 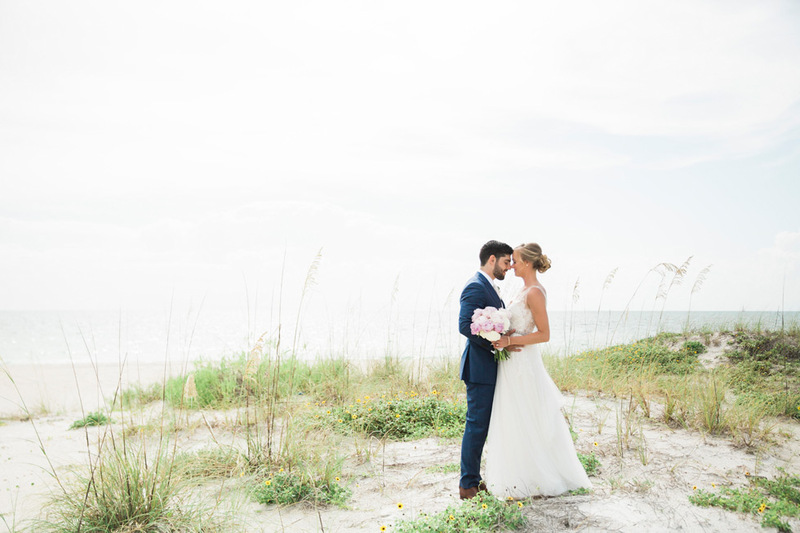 It was the perfect color scheme for this laid back beach wedding. We are loving these romantic, classic images of Mary + Joseph together at the beach before their wedding reception. They had absolutely beautiful weather for their wedding day, and these pictures do an amazing job for showing how in love these two are! The reception space at Carlouel Yacht Club looked gorgeous for Mary + Joseph’s reception. We loved all the thoughtful details that each of the tables had to pull the elegant look together. Congratulations on your wedding, Mary + Joseph! We were so honored to get to share in this amazing event with you both and wish you nothing but happiness ahead!